We are in need of a refrigerated box truck with an AC unit run by a generator. This box truck will give us the ability to receive perishable items that are currently being thrown away by businesses. All gifts (large or small) are very much appreciated. Please mark your donation(s) for this special project as "Refrigerated Truck." ​Thank you and God bless you for your prayers, kindness, and generosity. ministered to the saints, and do minister." More Than Conquerors/The Leroy Freeman Evangelistic Association, Inc. ~ is a 501 (c)(3) member in good standing with The Full Gospel Fellowship of Churches and Ministers International. Your gift of ANY size (either a one-time donation or an ongoing gift), makes a tremendous difference. All Gifts are Tax-deductible as allowed by Law. Mission = Serving God by serving others and SHOWING that we CARE, by offering Hope, Food, and Clothing. The US Department of Agriculture defines ‘food insecurity' as not knowing where you are going to get your next meal. Food insecurity is a great and growing problem that many families face in Palm Beach County. 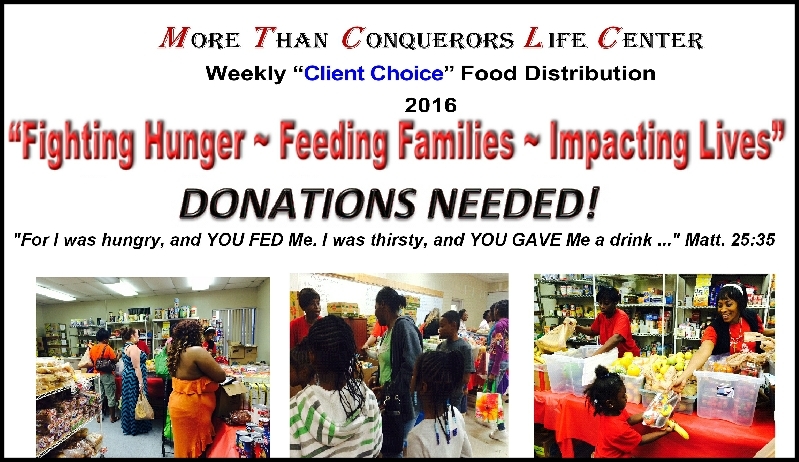 At More Than Conquerors Life Center we are doing something to assist those in need. We provide food assistance to (over one-hundred-and-fifty plus) families each week here in Palm Beach County. Hunger has no place in our community and we love being on the front lines doing something about it. We have so much more work to do to help more kids and families. To continue to help alleviate hunger, we see the need to EXPAND our food and clothing program. We are trusting to have the resources in the future to make that a reality. We are thankful for your generous support of financial and in-kind contributions, and of perishable & non-perishable food, clothing, and household items. Thank you so much for your interest and involvement in this ever-growing ministry, in whatever you are led to do to help us. We are having an impact in our community with the food, clothing, and household donations that we are blessed to distribute each week to those in need. We love what we do and we don't mind going the extra mile to help a family to have food to eat. Join Us - It takes many volunteers and hundreds of hours to receive and process the food that is donated. There are many Opportunities to get involved and also have a lot of fun at MTCLC Food Pantry. The joy received in giving back and serving others is truly Life Changing. Help us continue to Make a Difference in the lives of many! We invite you to COME and EXPERIENCE the Love, the Presence, the Power, and the Glory of Jesus our Lord!